What you’ll undoubtedly find as we move towards greater heights here at the Combative Corner, is that we’ll mention (often with great zeal) persons or things that inspire us. The book, The Elephant and The Twig supplies both; an extraordinary book & an extraordinary author. Geoff Thompson has been and continues to be, an inspiration to us and to all who read his words. 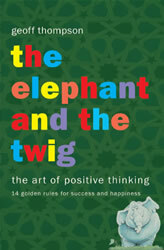 The Elephant and The Twig is a 177-page E-book (paperback available at his website) and is about the (somewhat “lost”)-art of positive thinking. Read as Thompson eloquently outlines for us the “14 Golden Rules to Success and Happiness.” This is truly a must-read; not only for us martial artists, but for the family man or woman, the business man or woman and the youngster that, perhaps, is looking to get “one-up” on this world. The Elephant and the Twig is available for a limited time only at GeoffThompson.Com and is given as a free gift for signing up for Thompson’s newsletter. And just for people hesitant about signing up for newsletters, Geoff’s newsletters are always informative, entertaining and sometimes, quite awe-inspiring. His newsletters come like clockwork and you won’t be sent anything outside of what you signed up for… the newsletter. If you ever do (which you won’t), isn’t it worth a free book?